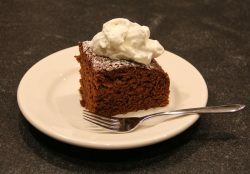 This recipe incorporates both fresh and ground ginger to create the right about of spiciness in this moist cake. With oven rack in the middle position, preheat oven to 325 degrees F. Grease and flour a 9 inch square cake pan. In large bowl of stand mixer, add baking soda to the boiling water. 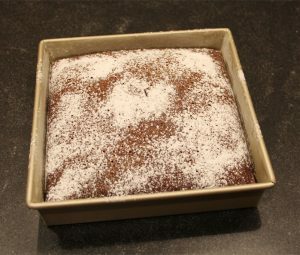 Stir in molasses, granulated sugar, and brown sugar. In a separate medium bowl combine flour, ground ginger, baking powder, salt, cinnamon, and ground cloves. To large mixing bowl with sugars, add eggs, oil, and grated ginger. Mix until combined. Gradually add flour mixture to bowl with mixer at low speed. Once incorporated; then beat at medium speed for 3 minutes, spraping sides of bowl with a rubber spatula as needed. Transfer batter to greased and floured pan. Bake 55 to 60 minutes or until a toothpick inserted into the center comes out clean. Cool cake in pan on a wire rack. Serve warm with whipped cream or vanilla ice cream or simply dust with confectioner's sugar.